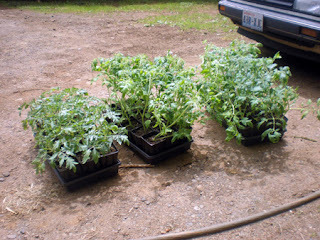 Homestead Garden – Tomatoes Planted!! What a fun day we all had yesterday. There were lots of pictures taken but one I really enjoyed was of all of my children. We got out one of my favorite pictures that was taken back in 2002…. Then we put the kids in the same positions yesterday, about 10 years later…. Aww.. yes, they do grow up!!! Here are a couple other favorites.. they were family shots. The only one missing was my daughter-in-law Lolot. She had to work and we were really sorry that she was not with us…. I’m back at it a couple days earlier than expected! I’ve been busy getting my home up and running again. Hubby and I took a little vacation to enjoy some sun and heat and my adult children kept the home fires burning. Now I’m waiting for the sun and heat to hit my part of the world. I hope to get my garden planted this coming week. In the meantime I am busy this weekend planning a big family Memorial Day barbeque. It may be in the rain, but no matter it will be fun to have all the kids and spouses and grandkids gathered together! A pic of me and hubby by the pool on our vacation…. I will be taking a little internet vacation break and will be gone for 2 weeks. I will be back to posting about the 28th of May. If you order anything from my country store, other than ebooks, your order will be mailed out on the 28th of May. All ebooks are automatic downloads. After your purchase (through Paypal) you will receive an email with a download link. A few weeks ago I was blessed with several dozen farm fresh eggs. I decided it would be the perfect time to put some breakfast foods in the freezer. I made Mcmom’s Breakfast Sandwiches and Breakfast Burritos. Sunshine in the PNW = Property & Garden Work! Today was the second day in a row of beautiful weather. My hubby wasted no time yesterday getting outside and getting the property under control. He drained the pond about half way and the kids cleaned out sticks and leaves and such from around the edges. Sierra pressure washed all the algae off the stairs and the dock (algae, mold and moss are a constant thing to deal with in our part of the world). He did a lot of mowing (to mow all the property takes about 5 hours). Isaac mowed around the garden and raked up broken sticks and made a big pile to be burned. The pond is now filling up again and soon it will be warm enough to swim in..
My second freezer cooking session was chicken. I bought 2 large chickens from Costco (total weight 10lbs). I put these chickens in my large 14qt stock pot, added 2 gallons of water and 2T salt. I let this simmer for about 30 hours. When it was done I strained the chicken from the broth. After it cooled I bagged about 8 quarts of stock.. While my stock and chicken where cooling down I made a double batch of brown rice. You can see my directions for making brown rice here: http://www.thefamilyhomestead.com/cookingwithbrownrice.htm . .. The first recipe I put together was Mexican Chicken & Rice. This is basically similar to my Mexican Hamburger and Rice recipe: http://www.thefamilyhomestead.com/mexicanhamburgerrice.htm For this version I used 5 cups cooked rice, 2 cups (1 pint) salsa, 3 cups cooked chicken meat. I mixed it altogether and put it in a gallon zip lock bag.. I started by cutting it all up into bite size pieces..